On Malaysian streets nowadays, main priority is given to vehicular elements, which seems to comprise the functional qualities of urban public space for human interaction. To perk up such streets, “pedestrianisation” results in making a city centre pedestrian- friendly, and expedites the preservation of historical districts. Problem statement: Existence of people engaging in a variety of sustained and social activities can makes a street lively. Approach: As liveliness involves levels of activities, uses, interactions and their representation, current research appraises street liveliness through behavioral observation of sustained pedestrians’ activities in Meldrum Walk. Result: The data on traffic modes, walking and sustained pedestrians of diverse age groups and genders, different types of activities, postures, over different times of day and night analyzed. Conclusion: Proposing a wider range of attractions and opportunities for activities besides walking, working and shopping for users of different age groups and capability - which would qualify the environment and lead to elaborate the liveliness of such streets, is recommended. In the present time, scrupulous use of energy is a challenge for the world population. The natural resources of energy are depleting day by day and the present resources seem inadequate to fulfill the need of human beings in future. Global warming and depletion of fossil fuels pose the dual crisis for sustainability. The building sector, being a major consumer of energy necessitates a critical scrutiny on this aspect. The techniques used for cooling, heating and ventilation of the buildings in the past were more harmonious with the nature. Use of locally available resources for design of historical buildings was energy efficient. The passive cooling in historical buildings provides a source of inspiration for sustainable development in contemporary world. 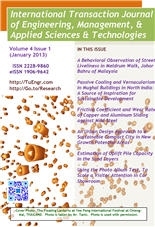 In this paper, the author has examined various passive cooling techniques and locally available resources used in Mughal buildings in North India. The design elements of these buildings have evaluated on the basis of their suitability to the climate. The findings of this study suggest further research to explore guidelines for designing energy efficient buildings for sustainable development in the present era and future world. Keywords: Copper; aluminum; friction coefficient; wear rate; mild steel; normal load; sliding velocity. increased while it increases when sliding velocity is increased for both copper and aluminum. In general, wear rate increases with the increased normal load and sliding velocity. Finally, as a comparison, it is found that friction coefficient and wear rate of copper are much lower than that of aluminum within the observed range of normal load and sliding velocity. Keywords: Sustainable compact city; Population Density; Conventional Energy; Land Resource; Urban sprawl. Existence of Cities always depends on the region for the resources-land, food, water, energy or maybe cheap labor. The resource base is vital for the survival of the cities. With increasing urban sprawl there is a great impact on the future of cities and their sustenance. The primary intent of the study is to demonstrate an Urban Design approach towards a sustainable compact urban model in new growth potential areas (case of Cyberabad, Hyderabad, India) as a means to counteract city’s faceless sprawl and environmental degradation by generating compact high density, low energy, mixed-use living and integrating it with the existing city fabric reducing the ecological footprint for future generations. As the selected site offers good natural features, ecologically sensitive areas of the site i.e. Steep slope areas, catchment channels and climatically unsuitable areas from the open space system of the development. The sustainable compact city design approach balances the environmental loads and the growth of city saving resources, conserving energy and enhancing the quality of life. Keywords: Ultimate uplift pile capacity; Tension pile load test; Uplift capacity; Sand layer. There are several methods available to analyze and evaluate the ultimate uplift capacity of pile in the sand layers, based on a homogeneous soil layer. This research compares the three estimations of ultimate uplift capacity of pile developed by Kulhawy et al (1979); Das (1983) and Chattopadhyay and Pise (1986). Since the field experiment did not reach the failure state, the Modified Mazurkiewicz method has been used to predict ultimate uplift capacity of piles. It is found that Kulhawy et al (1979) ultimate uplift capacity is closed to field data, providing the highest safety. In contrast, the ultimate uplift capacity by Chattopadhyay and Pise (1986) method shows the highest difference from the ultimate uplift capacity. Keywords: Colour Test; Photo Album Test; Projective Technique; Car Showroom; Showroom Design. Colour plays a vital role in visual perception, especially in the fields such as marketing, exhibitions and branding image. Colour is one of interior design elements, which the colour had a significant impact on the behaviour of human beings, within the interior spaces. This study aims to set a numeric scale, to measure the visitor attention into the auto-show exhibition space, by testing the effect of colour as an independent variable, on attracting visitor attention as a dependent variable. Our Photo Album is an instrument of projective technique to obtain the maximum level of validity and reliability of data collection during interviews. The interview recorded the respondents' impressions by manipulations of foreground and background colours. The data are recorded in the tables and analysed accordingly. The results show that there is a significant relationship between the colour effect and attracting the visitor attention. The technique developed and the result of the study will provide a base for future studies.